Workplace hearing loss is a major risk for workers in certain fields including the construction industry. Unfortunately, loud noises at work may do more than just damage your hearing. A new Canadian study indicates that being exposed to loud noises at work may put you at greater risk of other types of injuries as well. Those who sustain any type of injury on-the-job can take action and make a workers’ compensation claim. A Boston workplace injury lawyer can assist you in pursuing your work injury claim and obtaining medical benefits and disability income if your injuries prevent you from continuing to work. Canadian Occupational Safety reported on the new study about the risks of workplace injuries and hearing loss. More than 46,550 work records were reviewed for male workers over a 20-year period of time. The review focused on 1,670 of the workers who had been hospitalized for a work-related injury within five years of being given a hearing test. The number of injuries that occurred was compared with workers levels of hearing loss as indicated both by their exposure to loud noises and the loss revealed by the hearing tests. The data showed that for each decibel of hearing loss a worker experienced, there was a one percent increase in the risk of hospitalization resulting from a workplace injury. Further, workers who were exposed to noise levels exceeding 100 decibels had 2.4 times the risk of being hospitalized because of a work-related injury compared to a worker who had not been exposed to loud noises. For workers who had a combination of both severe hearing loss and a job in a workplace that frequently has noise exceeding 100 decibels, there was a 3.6 times greater risk of hospitalization than a worker who did not have either factor. The results suggest that hearing loss and loud workplaces may cause workers to miss warning signs of other types of workplace accidents. High noise levels are also likely to make workers more tired and to make workers less able to concentrate on the job they are doing. The quality of communication between workers is also impaired, thus it becomes more difficult for co-workers to warn others of an impending accident. The results of the study should be a major cause for concern in the United States, where as many as 30 million workers are exposed to excessive noise on the job. 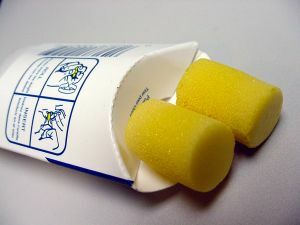 Some possible suggestions to reduce the risk include ensuring that proper hearing protection is provided to reduce hearing loss, as well as using visual signals for safety so hazards can be communicated even when it is difficult to hear what is going on. OSHA Moves Forward with Power Line Standard Update, January 25, 2014.